Especially for those of us living in the north, it is can be difficult to find affordable, fresh produce this time of year. When eating healthy, it is always better to choose organic (watch this video on why organic is better), but that may not always be an option depending on your budget and what your local store has to offer. The Environmental Working Group made a list of what has the highest and lowest amount of pesticides, use this guide when you are shopping. The EWG says you can lower your pesticide consumption by nearly four-fifths by buying the 12 most contaminated fruits and vegetables organic. Total health is the optimal state of mental, physical, nutritional and chemical health. 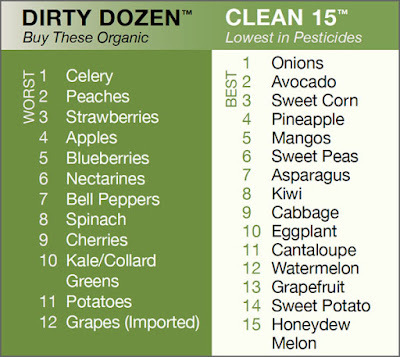 Buy organic as often as you can, especially with the dirty dozen listed above, to reduce your chemical stress. I buy organic as much as possible and I wash all produce by spraying it with a mixture of white vinegar and water, then rinse. The government claims that a small amount of pesticides won’t hurt you, but there is research linking these chemicals to many health issues from cancer to ADD. The EWG says, "Pesticides are designed to kill things. Why wait for 20 years to discover they are bad for us?" I agree! One question I've been asked many times is what I think about the new style of Shape-up tennis shoes. If you are looking for the right shoe to improve your gait and build muscle, I always recommend Vibram FiveFingers. Shape-ups alter our natural bio-mechanics dispersing stress unevenly throughout our bodies. The more natural the better, and Vibram FiveFingers are about as natural as you can get as they simulate walking and running barefoot. Our bodies are made to move a specific way starting with the way our feet come into contact with the ground. Our feet, ankles, knees, hips, pelvis and spine are all shaped the way they are to help disperse stress equally throughout our bodies. Many people can't jump right into wearing FiveFingers as their feet have adapted to regular shoes with too much cushion. Take your time and ease into wearing them, your body will thank you later! If you live in the Great Lakes Bay area, Vibram FiveFingers are available at Runners, for more information call 989-790-4000 or visit http://www.runnersperformancestore.com/. Read more about the benefits of Vibram FiveFingers here. I'm excited to feature another guest post today, this is by my friend Victoria Rechcygl. I went to Palmer College of Chiropractic in Florida with her husband Dr. Chad Rechcygl, and my wife and I enjoyed getting to know Victoria, Chad and their daughter Gemma. 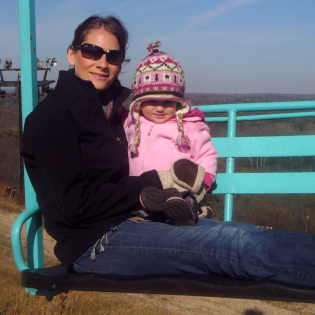 Owners of Rechcygl Family Chiropractic in Hales Corners, Wis., read more from Victoria at http://www.innatemama.com/ as she blogs about healthy recipes, raw food fasts, raising a healthy baby and more. ﻿I did a lot of work to keep my pregnant self, and growing baby healthy. My first priority was to get adjusted regularly by my chiropractor during my entire pregnancy. After my daughter was born, I made sure her spine was checked to make sure nothing had shifted from her birth. I learned a lot during my pregnancy, what my body and baby need and how she was developing. I was amazed to find out that the baby’s spine and nervous system is the first thing to develop. It makes sense, because the brain and nervous system run everything in our bodies from our beating hearts to our breathing lungs and immune systems. Everyone who spends time with us and sees our daughter is amazed by her. At 1 ½, she hardly ever gets sick and just gets the sniffles sometimes, sleeps like a rock, eats fruits and vegetables, has been alert from day one and she is always happy. We did not vaccinate her. She is stronger than any chemical that could go into her body and hinder her health. She has such a strong immune system, and much of that is due to her regular adjustments. Ronald Pero, Ph.D., chief of cancer prevention research at New York’s Preventive Medicine Institute and professor of medicine at New York University, did a study measuring the immunity of chiropractic patients. His initial three-year study of 107 individuals studied people who had been under chiropractic care for five years or more. The chiropractic patients were found to have a 200% greater immune competence than those people who had not received chiropractic care, and they had 400% greater immune competence than those people with cancer and other serious diseases. And as Dr. Pero noted, the immune system superiority of those under chiropractic care did not appear to diminish with age. More and more studies have shown that a chiropractic patient’s immunity after an adjustment. My family and I might get sick, but it will not last long. Knowing this, I felt much more powerful and in control of my daughter’s spine, and ultimately her total health. People say to me, "You're such a calm mom, what's your secret?" Honestly, it's knowing a chiropractic adjustment, and the perfect structure in my daughters spine, is the key to ultimate health, and longevity. I don't have to worry if she falls over, or gets a few sniffles. I know that her body heals, from her brain down through her spine, and out over her nerves to her organs and body, it simply needs no interference. That is why I am so grateful for my chiropractor, who is also my husband. With chiropractic and a wellness lifestyle, we've seen kids on anti-depressants and Ritalin, get off their medication and be happy, healthy, focused children. We've seen babies who are scheduled to get tubes put in their ears, with "chronic" ear infections, get adjusted once, and the next day they are healed. It is possible! This is why my daughter, and any future children we have will get adjusted from the moment they are born, for the rest of their life. We all want what is best for our kids. You have everything to gain by getting your kids spines checked, and adjusted today! I recently featured another mom of a chiropractic family, click here to read Jenn Cohen’s article on the benefits of exercise and chiropractic care during pregnancy. Eating healthy and eliminating processed carbohydrates isn’t always easy and a lot of the time you have to be creative in your meal choices. Almost all crunchy snack­­s are highly processed and made with unhealthy carbohydrates. If you have a dehydrator and like tomatoes then tomato chips are a great option! Not only do they taste great, but tomatoes contain a powerful carotenoid named lycopene. Lycopene has been shown to help reduce the risk of prostate, lung, stomach and multiple other cancers. It has also been shown to help reduce oxidation and damage to the heart leading to a reduced risk of heart disease. Leave in dehydrator for 12­ - 24 hours until crunchy. Sign up for a free health class by Dr. Kehres. Monday, Feb. 7 or Thursday, Feb. 17, 6:30 - 7:30 pm, at Kehres Health & Chiropractic in Saginaw. We invite you to come and bring a friend! Click here for more information and to RSVP. It is one month into the New Year and many of us have forgotten about our New Year’s resolution. Instead of New Year’s resolution, why not start making New Month’s resolutions? 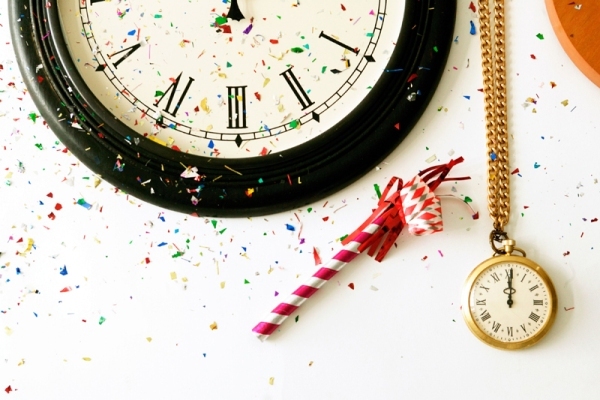 With traditional annual resolutions people tend to put off making big goals the whole year, waiting until New Year’s Eve, focusing on it for the first few weeks, then putting it off for the rest of the year again. This year, let’s celebrate accomplishments and re-focus on new goals each month. If your resolution was to get healthy and lose weight this year, focus on incorporating two new vegetables into your daily meals this month. Or to try a new workout class at the gym three times a week. Then next month, re-evaluate your progress and pick another small goal to focus on. Don’t sit around and wait for the New Year to come around to set goals, challenge yourself throughout the year.